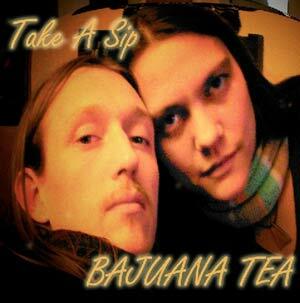 "Bajuana Tea has been brewing together since high school and live to jam! Austin and Matrisha have been playing various instruments for over ten years together. These days they are creating a soulful, smoky blend of organic rock inspired by blues, 60's classics and funky jam bands. Bajuana Tea consists of raw, all-natural ingredients and a sound that is heavily steeped for a savory product. Bajuana Tea recorded their first self-released album (100% Natural) in 2005 and their second (Something’s Got To Change) in 2007 at their home studio. This past year they have hit the local performing scene and began mixing it up with various artists in and out of their own box. Austin and Matrisha are practiced in the ability to perform electrically charged rock sets, but also take it down and entertain an entirely different crowd with mellow, acoustic jams. Currently working on their first acoustic album and enough material for another electric album next year, Bajuana Tea is enjoying the musical life. Performing at a wide variety of events including parties, weddings, outdoor festivals, picnics, birthdays, restaurants, stores and celebrations, playing songs ranging from original acoustic and psychedelic electric brews to rootsy blues jams and funky wailers. Bajuana Tea comes complete with merchandise and a fan club for any event - check out the rich blends and take a sip..."